"One of the great classic bourbon cocktails, the Old Fashioned was invented in Louisville, KY. Try bourbon, rye, or a blended whiskey in this cocktail. You can also sub one sugar cube for the simple syrup." Pour the simple syrup, water, and bitters into a whiskey glass. Stir to combine, then place the ice cubes in the glass. 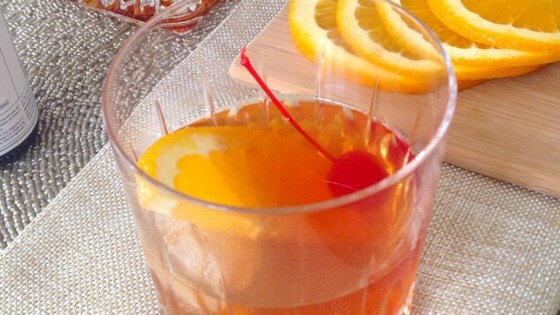 Pour bourbon over the ice and garnish with the orange slice and maraschino cherry. Simple drink to make for a fancier evening, date night or just because! To make it more palatable (for those who don't like straight booze) a splash of club soda or 7 up is great! delish! i used club soda instead of water, instead for a little bit of fizz and doubled up on the orange slices.